Any food adventure to France must provide some insight into cheese – in my case it was at least 15 cheeses before I lost count! On arriving in Bordeaux my guide introduced me to Pierre Rollet Garrard, a fromagerier with a good local reputation. He was a wonderfully friendly fellow with a great sense of humour, strong French traits and an absolute passion for cheese. Pierre has a stall at the Libourne market, but also operates from a shop in Bordeaux where we caught up. Before bounding into the tastings we needed some bread and wine – not of the religious kind, but fresh baguette from a nearby boulangerie and a bottle of white that Pierre grabbed from a shelf behind the counter. He chose a wine from the Jurragh region (near the French alps) where our first cheeses came from. They were cows’ milk hard cheeses, some Comte, which ranged in age from 6 to 18 months. All nice cheeses, but the ageing process gave an excellent result with the 18month cheese showing much greater complexity and deeper flavour, with white crystals forming within the cheese, giving it a slightly crunchy texture. Pierre was at pains to emphasise the importance of the affineur, whose roll it is to properly store and age the cheese, and know when it is fully ripe for eating. So some of these cheeses came from rolls that were 30-50kg, and I asked Pierre the significance of this. These cheeses are being made to recipes hundreds of years old, when the wheels of cheese would be rolled down from the mountains where they were made – hence the shape! And while in Australia we have changed the weight of lots of products to suit occupational health and safety standards, cheeses are still made in 30-50kg wheels because of tradition! We sampled a hard cheese with a layer of charcoal through the middle. Apparently many years ago, the farmer only had sufficient milk in each milking for half a wheel of cheese. So charcoal was placed on top of the morning’s cheese as a protective layer, followed by cheese from the afternoon milking. Tradition has it that the charcoal is still used in the cheese! Then some soft cheeses including a Reblochon from the Savoie region (in the alps near the Italian border) and some Bries from south of Paris. Again, same cheese type, but quite different flavours. 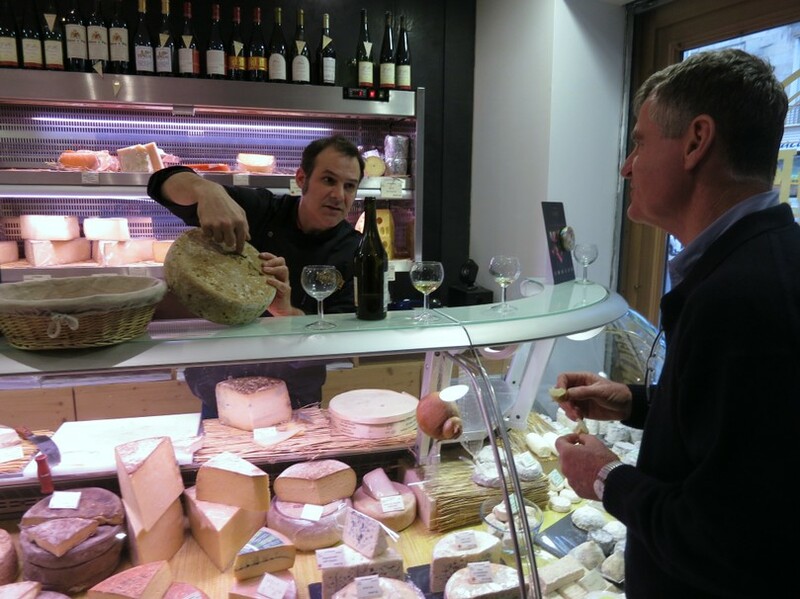 Here Pierre emphasised the difference between farmhouse and artisan cheeses. The former being made by the farmers who collected the milk, while the artisan maker buys milk from a few key suppliers with which the cheeses are made. We skipped the camembert and other soft cheeses from Normandy (I had just about had enough) to move onto some sheeps’ milk cheese from south-west. This was milk that used to be used in the production of the famous Roqufort blue cheese, but due to regulations was no longer able to be used here. Pierre told us of the older lady, toughened by life in this hard mountain country who decided to make her own soft cheeses – beautiful to taste, but I believe Gippsland’s own Prom Country Cheese’s "Woolamai Mist" is right up there with them. With my stomach starting to ache, Pierre insisted we experience some goats’ milk cheeses – a hard and soft. These were washed down with some vanilla flavoured liquid yoghurt, followed by a taste of his butter flavoured with summer truffle. He was quick to point out the summer truffle is inferior to the winter truffle, but nevertheless the butter was the best I’d ever tasted - incredibly rich and flavoursome. The two hour session was an unforgettable food adventure. Pierre is a charming man, with a smile only leaving his face when he is focussed on his passion – and there’s no joking about cheese!